I gotta say the withdrawal symptoms from daily Disneyland visits are getting milder, but I’m home from a week in Anaheim for HP Storage Tech Day and Nth Generation’s 13th Symposium. If you didn’t see it, my preview was posted last month here on rsts11. I’ll have some more detailed thoughts, including at least one topic that I hadn’t really expected to provoke so much thought, in the next few days. But I wanted to touch on two of the highlights from the Symposium while they’re fresh in my mind. Disclaimer: Travel to HP Storage Tech Day/Nth Generation Symposium was paid for by HP; however, no monetary compensation is expected nor received for the content that is written in this blog. Nth Symposium is an annual partner and customer summit held by Nth Generation, the leading HP channel partner in southern California. They’ve done this thirteen times now, bringing customer technologists and executives together with HP and partner representatives for a very productive event. It’s free to qualified IT professionals, so I’d suggest checking it out next year if you are in the area. Two of the three Nth Symposium keynotes were by execs I’ve worked for before. I was farther down the org chart from (now HP CEO) Meg Whitman when I was at the shopping.com division of eBay in 2006, but she gave the executive welcome at my new hire orientation. I reported to a VP at 3PAR who reported directly to (now HP Storage VP/GM) David Scott back in 2001. I knew both would be very impressive speakers for a keynote. 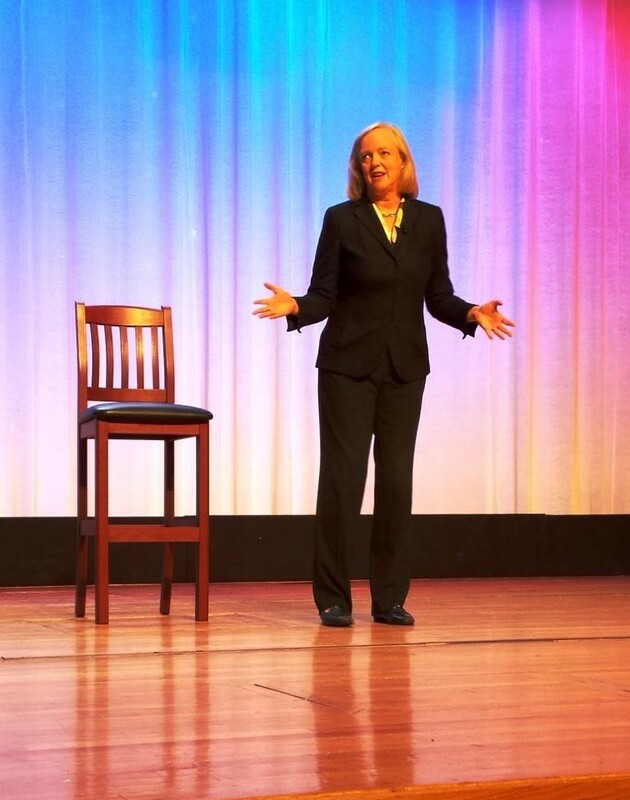 In a definite score for Nth Generation, they convinced Meg Whitman, president and CEO of HP, to give the headline keynote at this year’s symposium. Whitman’s ability to know on a detailed level, communicate, and see the path forward for a hugely disparate business that probably seems like it’s going that-a-way at full speed in every direction is impressive. The high level overview of the company’s direction, and the “New Style of IT,” was to be expected, but her willingness and ability to field unstaged questions from the audience and respond to them in an honest and aware way was what really impressed me. The three questions I remember involved cross-border ordering and SKU simplification (so that you can easily order the same model for delivery to multiple countries), support cohesiveness and contactability (and responsibility), and the morass that is hp.com. Fellow blogger John Obeto was set up for a question when Meg called out Nigeria as one of the countries that would not see SKU simplification this year. But she acknowledged that the complexity was counterproductive, and that the company is already working to solve the problems for multinational customers. Another attendee mentioned the challenges of finding the right contact for support, especially (as I recall) when multiple product lines are involved, or when your contacts at HP leave the company. Having had my HP account manager leave after my first order a couple of jobs ago, and having had her replacements actively and effectively lose my followup business in the months that followed, I know what a pain this can be. Meg acknowledged the problem as a significant one, suggested using a partner or VAR as an aggregator for contacts within HP (since VARs would have more access to experts and resources within the HP organization), and concluded by offering her personal email address and committing to help until other paths are finalized. But back to John, who came up to the microphone to decry the exclusion of Nigeria for the 2013 SKU project, and to mention something that probably everyone who has tried to used the HP site for anything but B2C e-commerce already knows… that hp.com is pretty difficult to navigate. Meg once again acknowledged the problem–see a pattern here?–and said that they were working on the business-to-business (B2B) and business-to-consumer (B2C) sites separately. One is already under a substantial reorganization, and the other will follow as soon as practical. In general, I got the sense of Meg Whitman as a CEO being not entirely unlike the (parody) President Jimmy Carter’s fireside chat from Saturday Night Live in the late 70s. I wouldn’t ask her about acid experiences, but it seemed if you asked her about something even several levels down in the chain that was affecting customers, she’d know what was going on and be able to respond to it (or be willing to take the question on and find an answer). On the topic of hp.com, Paul Santeler put further time into the discussion of Moonshot in the talk that followed Meg’s keynote, but as I recall Meg also made the bullet point on Moonshot that hp.com now runs on Moonshot rather than a huge farm of servers. 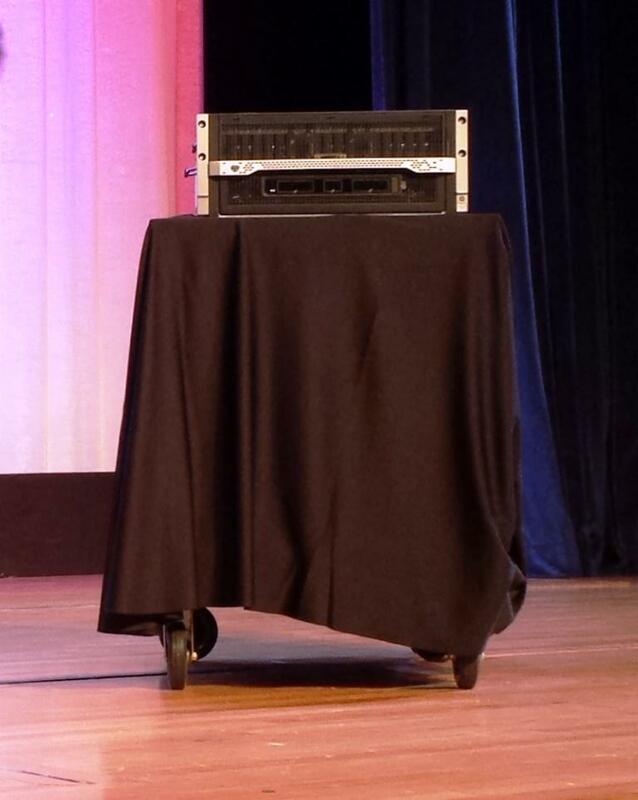 Moonshot is a sub-5U chassis that contains up to 45 server “cartridges” running the Intel Atom S1260 at 2GHz. The cartridge is a bit larger than a Kindle Fire and sports an 8GB ECC dimm, dual gigabit Ethernet (through a central switching module pair), and a single 2.5″ laptop-style hard drive that can be 500GB or 1TB of 7200rpm spinning disk a 200GB MLC SSD. The 45G switching modules live in the center of the chassis, and the two 6SFP uplink modules give 6 1GBE/10GBE uplinks each via SFP+ connectors. Standard configuration gives you one switch module and one uplink module; the redundancy option is a custom configuration. A 40GBE module is coming soon. The systems are managed via iLO Chassis Management, and multiple systems can be daisy-chained. If you’d seen the Seamicro systems circa 2009-2010, the Moonshot will seem like at least an evolutionary development from that concept. The first times I spoke with Seamicro about their 10U chassis, I asked about a smaller system, around 4U, with fewer than the stock 64 systems. Moonshot gives nearly the capacity of that 10U system, 40% more system RAM, dedicated per-system storage, a third the footprint, and a lower power draw. There are other cartridges coming, including an 8-core 32GB cassette (good for thin virtualization) and a DSP-targeted cassette (voice processing and so forth, running on ARM), so it shouldn’t be a one-trick pony platform. It won’t replace all rackmount and conventional blade servers, but hyperscale is likely to fill a few niches and simplify management and scalability. One thing I asked about often during my time on Technology Drive in 2001-2002 was a smaller starting point for the InServ platform. With the E and F series, they made some steps in that direction, and I bought an E200 for high performance storage at Trulia a few years ago. But with their new 7200 model, they go even farther into the realm of possibility with a starting list price around $25k. I’ll be bringing you some details on their platform and enhancements in the next week. I’ll also be looking at the comparison between utility computing platforms from HP and Cisco, a topic that was featured in one of the second tier keynotes. Stay tuned, and wish me luck on the recovery from convention plague if you don’t mind.